Thanks to all the men and women in the CompuServe science and Ham.net forums in the late 1980’s-1990. Thanks to Maurice Cotterell who helped by motivating me. Thanks to my mother and father and the great man upstairs. Thanks to my Lord and Savior Jesus the Christ who delivered me from the hands of the devil and a probable shipwrecked life. And to the angelic beings who fought battles with me, thanks. Mine is not the only gravity theory. The conventional theory has ‘no gravity force’ in it, requires very expensive detectors and cannot use beach sand or radio frequencies to detect gravity. The theory presented in this book is more fun and permits much easier detection. General relativity is a theory of gravitation developed by Einstein in the years 1907–1915. The development of general relativity began with the equivalence principle, which the states of accelerated motion and being at rest in a gravitational field (for example when standing on the surface of Earth) are physically identical. The upshot of this is that inertial motion of an object is free-falling because that is how objects move when there is no force being exerted on them, instead of this being due to the force of gravity, as is the case in classical mechanics. This is incompatible with classical mechanics and special relativity because in those theories inertial moving objects cannot accelerate with respect to each other, but objects in free-fall do so. To resolve this difficulty Einstein first proposed that space-time is curved. In 1915, he devised the field equations which relate the curvature of space-time to the mass, energy, and momentum within it. It might be easy for the reader to take one look and reject my theory on the ground that flowing water alone causes ripples. No one would study ripples as I have since the 1990’s if “ripples in the sand” were all there was to it. Keep in mind that the helix-feature of this beach phenomenon I describe is found throughout nature. I wrote this book to explain a phenomenon I discovered while walking along the beach at Fort Stevens State Park. Walking along the beach I became curious about what did not seem to be the simple ripples in the sand found with almost all moving water, especially with river water that flows in one direction only. I found there are two ways the sand ripples can be formed at this beach, one from simple wave collisions and the other from what was reviled to me, by synodic movements of nearby heavenly bodies. I studied for many years before coming to my conclusions. As time went by I uncovered more and more of the phenomenon, eventually attributing much of it to the beat frequencies of gravitational waves. I firmly believe crop circles have somewhat a relationship to these sand patterns, as well as some of Earth’s weather. All the attributes of Einstein’s general relativity were resolved with the theory generated from this study. There is a proof that goes along with this incorporating the Michelson Interferometer. Because Einstein’s general theory of gravity has no force and has not been connected to quantum theory, we will explore within this book another possibility for gravity theory. We will associate it to quantum theory, put a force in and provide a unique way to detect and prove it so that anyone can understand. Because gravity waves cannot be detected in the usual ways it becomes very mysterious so science had to come up with mysterious explanations for it. Scientists solely using mathematics have decided that warped or curved space and time (general relativity: space-time) is correct because the math answers are correct. However, we all know that math can arrive at the same answer many different ways. Gravity waves so mysterious because they pass through everything…they have a cloak of invisibility (so to speak) sort of like air until the wind blows. However, with common radio techniques incorporated within every radio, the gravity wave can be altered enough to be detected, in this case naturally. Astronomers try to detect perturbations in existing gravitational waves generated by catastrophic stellar events such as supernovae or by pulsars, looking for perturbations in the existing field. LIGO (Laser Interferometer Gravitational-wave Observatory) is a large scale, expensive physics experiment operated by Caltech and MIT. LIGO can only detect fluctuations originating with an event, like that of two black holes colliding and not the gravitational field per se. Gravity is everywhere. It is powerful enough to hold your car down on the road. It is uncharacteristic of modern-day instrumentation that science is only able to detect the fluctuations of a field and not the (gravity) field itself. Weighing oneself on a bathroom scale is simply the result of the fluctuations pulling one down on the scale, not the field itself doing so. That is similar to what LIGO does while detecting fluctuations only. This book is describing a natural gravity detector that is sensitive to the waves themselves, not just the perturbations as in current detection methods. It took some time before I became convinced that there was something else exhibiting here other than the universal rippling of sand due to ocean waves crashing onto the beach. Only close study of video records, and being there at the right time will convince those with doubts. When our sand patterns are forming, they appear simultaneously for over 40 miles of coastline. Astoria, Oregon is very near the end of the historic Lewis and Clark trail, a trek of discovery across early America in the very early 1800’s. The treacherous Columbia River bar is known as the “Graveyard of the Pacific” due to several hundreds of shipwrecks of all types there. A large number of underwater mines were placed around the mouth of the Columbia during World War II. Hence, there is a high concentration of rust particles in the fine sands, presumably from naval activities as well as shipwrecks. A magnet readily picks up rust particles from the dry sand. Very significant is the rusting skeleton of an English sailing ship that beached in a storm in 1906, the PETER IREDALE, permanently stuck in the surf and sand. It is visible in the distance in the photographs. Scientists have spent millions of dollars trying to detect gravity waves, and here they are, right before our very eyes. Astoria is the best beach to witness the phenomenon. The absence or scant presence of iron oxide particles seems to be the reason why the phenomenon is reduced or even nonexistent on numerous other beaches. On the beach at Fort Stevens State Park the sand consists of black paramagnetic particles along with the natural sand (paramagnetic means that the material is slightly magnetic). The paramagnetic rust particles are assumed to be Fe2O3. If you run a magnet over dry sand the particle is picked up readily and exists probably as some fraction of the sand up to 5 percent. (Interestingly, the black sand beaches of Curry County south of the Fort Stevens area have a high concentration of zirconium; slightly radioactive, the sand is mined for the manufacture of exotic metals.) Sand particle size is extremely fine at the Park beach, averaging .005-inch diameter. The iron oxide particle is even smaller. I know we are not studying river sand, which particles are quite larger. There are very subtle forces at work here! IMAGE 1. The shipwreck PETER IREDALE, upper right hand corner: (GPS) 46 deg. 10 min. 28 sec. N. Lat. 123 deg. 59 min. 06 sec. W. Long. The normally clean bluish hue of the surf water has been discolored by black iron oxide particles. This only occurs during strong gravitational events. The particles have been pulled upward out of the sand by heterodyned gravitational waves. THE DARK PATCH AREAS ARE RUST PARTICLES TRYING TO STAND ON END MUCH LIKE IRON FILINGS DO WHEN PLACED ON A PAPER AND A MAGNET IS HELD BELOW. POSTULATE: Gravity is an electromagnetic wave of extremely small wavelength emitted from the proton and/or neutron. On this beach at the water line and only during certain times of the year and day a phenomenon occurs. The phenomenon is best seen on this gradually sloping beach during a flattening wave when the water is only 1-6 or so inches deep. The rust particles along with the standard sand go into solution. Due to the unique turbulence that occurs in this flattening wave the magnetic particles align themselves along electromagnetic field lines. The distance between lines (the wavelength) is usually from 12-46 inches. The magnetic particles are deposited at regular intervals. When the water slowly glides back out to sea a mound and rift is left in the wet sand. When the conditions are maximum, from the bottom of the rift to the top of the mound measures approximately 3\16 inch or so, and are 1 – 1.5 inches wide. One could stumble on them. The black particles form a line attracted to an unusual stationary invisible electromagnetic wave. It is similar to the type of mound and rift that is formed when water flows over a stationary shallow rod (1/8 diameter or so) resting on the sand. A strange “double” water ripple gouges the grooves. First, one water ripple; then, about one inch later, another water ripple with a deep groove between. The pattern placed upon the beach resembles an interference pattern at times and at other times it is of fairly uniform wavelength. These grooves form intermittently, lasting for several hours and longer. They wash away then reappear over and over again until the event passes, sometimes appearing in patches or covering the entire beach. When the phenomenon is at maximum the wet sand becomes much softer (puffy) and more difficult to walk upon, much like the before and after changes of rice when you cook it. The event is predicted using precise Moon-Doppler and Earth-Sun-Doppler astronomy computer programs. Here is a video of the phenomenon. Shown between the arrows, only the last part of the wave when it flattens out on the beach is of importance in the phenomenon. The gradual slope of this beach contributes to the formation of a very sensitive detector. It forms a very slight interruption of the normal particle flow within the water, generating an observable domino effect, induced by silica-quartz sand plus the iron oxide (silica-quartz is a semiconductor used in transistor and microprocessor manufacturing; rust on antenna guy wires is well known by ham radio operators to cause interference by heterodyning of signals). Combined, the particles align due to electromagnetic forces, allowing for the visual effect similar to a coherer (an early device used to detect radio waves). The domino effect may not be entirely based on the particles, but also on a very slight water disturbance. Strong winds have little or no effect on the forming of the grooves. The phenomenon occurs as well on a calm day as a windy day. The formation releases and instantly disappears when the water flow velocity becomes too great. This can be seen clearly when the receding velocity of the water exceeds the attraction forces of the formation. Traveling 60 miles south I found the particles had reduced a significant amount. The grooves as well were much less pronounced. The Long Beach area in Washington also has a significant amount. This is where I first associated the visual with the physical feeling of the phenomenon (suggesting an ancillary hypothesis of the effects of microwaves on aging). some time after the groove formation stops. The radio waves can travel back after the phenomenon leaves the beach sand area. The frequencies shift around but there do seem to be some patterns. Occasionally a barrage or flurry of unidentified wavelengths will appear. Scans were taken from 1 GHz to 33 MHz. My hypothesis is that the beach acts like a huge transistor or hot carrier diode. The combination of rust, quartz in the sand, and salt water as the conductor, enable signals to combine (heterodyne or mix) producing 2 more signals and a host of harmonics. Rust on antenna guy wires is known by ham radio operations to cause heterodyning of signals and is a common problem. An alternate but related hypothesis: Telluric currents also might be partially responsible for the formations. Telluric currents are naturally occurring electric currents that pass through the ground. The Telluric currents would be originating from planetary motions. The resulting radio frequencies from synodic waves seem to quantum jump to new frequencies, charging earthly elements up on one wavelength, and then discharging on another, much like a laser or phosphorescent rocks when exposed to black light. This is probably why the beach lines appear at sometimes unpredictable intervals. Without the proper equipment I was unable to determine if this quantum jumping was occurring with certainty. The patterns have been directly related to Doppler-shifted planetary motions. Doppler radar is used by weather men to detect falling rain. The other half of the theory is very common process that happens with all waves including music. They have beat frequencies when two notes are played together. Anyone who has studied music knows this – it is very simple. Combining the two together ‘Doppler’ and ‘beat frequencies’ along with the helix wave, results in the completion of the basics of the theory. For example say both the moon and Earth are emitting the musical note middle C (which happens to be 261 cycles). So we, standing on Earth, constantly hear the hum of Earth’s middle C. The Moon is also emitting middle C but because it orbits us in an ellipse the note constantly Doppler-shifts up and then down as its orbit takes it toward and away from us every 28 days. So now we have two notes that can be heard here on Earth: Earth’s middle C and the Moon’s Doppler-shifted middle C which constantly Doppler-shifts to new notes, like a slow wow-wow heard from pressing on the vibrato or tremolo bar on the electric guitar. Or a better example is a train whistle which changes pitch when coming toward an observer, then away. But if we listen carefully we will hear a third note, which is the beat frequency from subtracting the two musical notes together. (Actually the frequencies both add and subtract but we are only interested in the result from subtraction). So now we can hear three notes: These are Earth’s middle C, the Moon’s Doppler shifted middle C, and the beat frequency from hearing the two notes at the same time. It is this beat frequency that can form the beach sand phenomenon but only on specific dates and times. Why it only shows on specific dates and hours requires a bit more understanding of orbital mechanics, and of course the frequency of gravity is much higher than middle C. A sample video of this can be found here. Now imagine that these are gravity waves and that these waves pass right through us and everything around us. Sort of like an invisible field. Like the air around us we don’t notice it until it moves. However we can imagine that something is there, because something is holding everything down to Earth. Our instruments cannot detect it because it passes through them also, leaving only the evidence of its force. However, like playing the musical note middle C in the above example where it Doppler shifts and becomes a beat frequency there may be times we can detect it, if we open our eyes, and look close enough. I eventually found it possible to calculate a gravitation wavelength from the data collected (next section). It is best to look for the phenomenon of gravity wave grooving when the tide is going out (from high to low), so pick up some tide tables at Fort Stevens or go to saltwatertides.com and click Oregon, then Astoria. Divide 11803 by the groove-to-groove distance to find frequency in MHz. Some common approximate distances from groove-to-groove: 12.3 inch / 14 inch / 18 inch / 20 inch /24 inch / 26 inch / 29 inch / 30.5 inch /46 inch. This is not always applicable due to the quantum transition level emissions (hypothesis). The wavelength of the level is rarely the emission wavelength. The term ‘wavelength’ here is used loosely. However, occasionally there does appear to be an RF wavelength match to the groove-to-groove distance. Imagine large coils of spirals buried with in the sand at different angles with various amounts exposed much like a bunch of logs buried to different levels. You can only see the widths (the grooves) so the measurement is dependent upon how much of the coil is buried. Sometimes the grooves extend hundreds of feet, maintaining their position from one wave to the next as though something stationary was forming them. Something impeding the normal flow of water remains in position wave after wave but slowly migrates until the forces pull it apart where by it grabs hold in another nearby area. Regarding the exact groove measurement /frequency correlation. Often it is difficult to make exact frequency to wavelength correlation. The groove patterns are often formed from the heterodyning of 3 different wavelengths. The resulting groove dimensions stretch from one wavelength to another and another (visible results of the heterodyning process). This makes the measurement to frequency match difficult. Another factor is the immediate re-absorption of the wavelength resulting in very weak signals. Many other accompanying radio wavelengths from quantum jumps appear in RF but not as sand grooves. Another RF relationship might be found in the snapping apart of the heterodyned waves. This emission should correlate to the difference between the two grooves that are heterodyning. Use of the energy level transition jump method to find frequency relationships should be helpful, for , example the difference between groove-to-groove dimensions of stretched grooves may reveal the RF (the corresponding photon). Standard RF emissions cannot duplicate the groove formation. This is due to the alternation of the poles during normal RF propagation. A standing wave might, however. These grooves are probably formed by an unusual type of rotation of the polarity of these waves. You should find the groove-to-groove distance maintains a specific set of particular dimensions. Recognizing certain patterns and sets (for example, the 12 inch) often occurs alone. The 18 – 24 form together. The very wide often occur alone. One must determine that they actually formed at the same interval. Sets found on the entire beach from high to low tide may vary. Try to estimate which ones formed together at the same time. Of course sand ripples can be formed by flowing water motions; what I have outlined here is something entirely different. Sand patterns can be caused by both water wave motions and gravitational forces. The gravitational sand patterns can be further separated out into gravitational forces pulling from two separate directions (Moon and Sun), and into Doppler-shifted then heterodyned gravitational waves. Normally scientists only relate the sand patterns to wind and wave motions. If heavy particles are present in the sand a sluice box effect occurs during water wave collisions, resulting in a fake occurrence of the sand patterns. We all know that the Moon and Sun controls the tides. It is not necessary to be at this beach to witness heterodyned gravitational effects. The effects can also be seen in slow moving river water or lakes but only on certain dates and times. Rippling water visually changes the texture of the surface dramatically at times here on the Columbia River. I drove by every day for months and looked upon the water. The surface was always smooth with normal rippling textures that accompany calm or mild breeze. Then for no apparent reason the surface took on an unusual appearance like broken up ripples popping up and down. Lakes seem to produce these broken up ripples when the air currents are light (air currents are also influenced by heterodyned gravitational waves as well which confuses the study. When the gravity forces are pulling upward the winds pull upward. This is a rare occurrence probably only several times a year but may last for a week or more lasting for 1-1.5 hour intervals with the start time increasing about 30 minutes each day until the event is over. These are related to the ocean tides but on land locked water. Some initial water movement seems to be required as I’ve never seen this motion in a swimming pool. However, it is difficult to separate the slight breezes (air movements) effects out as they often occur at the same time. Looking for changes in the type of ripple motions is important consideration when the wind velocity is at the very minimum. I believe changes in the ripple motions on small lakes are also part of this affect (again it is difficult to separate the slight breezes out). It is much more difficult to be scientific with river and lake water ripple motions as it is difficult to separate the wind and water flow conditions out. With the beach sand iron oxide phenomenon, separating the variables out is not a difficult task. The correct timing of the event is based around the Moon’s orbit around Earth or Earth’s orbit around the sun. Either orbit can produce the phenomenon, but are considered separate events. Since it is easily to dismiss this phenomenon as forming from simple water flow motions, I want to be certain without a doubt it is known that there are two types of conditions that form the sand patterns. Many of the patterns are formed by the intersection collision of minute shore waves coming from opposite directions. The collisions of opposing water waves produce a sluice-box-like effect. This is not a part of the gravitational phenomenon as described here. Prospectors use sluice boxes to separate gold from river sand. The sluice box like effects mimics the formation of the sand patterns by depositing the heavier rust particles during the collision. The slowing of the water during the collision allows the heavier rust particles to drop onto the surface of the sand forming a dark colored line of rust. In addition, the water ripple digs a groove in the sand resulting in patterns that are nearly identical-but not so. The ‘wet’ sand remains hard and easy to walk upon unlike the ‘wet ‘sand when the phenomenon if forming by heterodyned gravitational waves. Care must be taken discerning the true gravity-wave-induced-sand pattern grooves from the natural occurring sand ripples. Incorrect: The patterns left by the collision of two small size water waves (approximately 2-6 inches high) is NOT part of the phenomenon. Correct: The groove in the sand left by a single small water wave passing through an invisible temporarily stationary electromagnetic field (note: the field normally moves but can become stationary long enough to leave a single line). Multiple field lines form the complete patterns. There must be no wave to wave collisions as shown in figure 4 occurring in order to identify this event. For no apparent reason a water ripple appears. It is well known that the Moon pulls on water causing the tides. Less apparent however and not well recognized it also pulls on all mass including the atmospheric air and the water in clouds. A dwelling of topo centric Doppler velocities of gravitational waves at specific times slows down the gravitational waves sweeping across Earth’s surface and enables effects not seen in simple tidal six hour intervals. I was never able to fully identify or separate out the wind from the gravitational rippling of the water. Abnormal undulating movements in small water ripples occur for no apparent reason. A close study of rivers and lakes reveals that at certain times something other than wind is causing or enhancing minute ripple motions. Accompanying lite wind conditions (at specific times) the water ripple motions on small lakes or ponds and smooth flowing rivers the ripple motions observed are amplified by Doppler-shifted and heterodyned gravitational waves. Self-sustaining rippling motions more than the light wind could produce and appears to enhance or amplify the ripple motions. This effect can also be seen on a calm ocean sea conditions. This condition was observed out beyond the surf just before the sand pools event at Fort Stevens State Park as well on small lakes and smooth flowing rivers when the wind conditions were light and not sufficient to form the ripples alone. This related phenomenon is apparent in two hour cycles and the six-hour tidal cycle and is altered by the position of the Moon and or Sun. A 12-hour cycle also appears in the Moon Doppler data of ‘MoonSked’ Moon-bounce software. The sky position of the Moon may minutely drag the ripple wave crests in other than just straight down river. In the case of lakes and smooth flowing rivers, look for changes in ripple motions in both two hours and six hour cycles. Unless one has a very critical eye a video camera is required to record the changes. It may be difficult to separate wind rippling from gravitational effects, however, the effect at times can be dramatic and easy to identify. Here one must separate out how much rippling a light wind would produce. In the case of a calm river that flows east to west (same as Earth’s rotation) at time when the Moon and or Sun both are in the easterly direction the ripples convolute and the crests will slightly convolute to the easterly direction or upstream direction (toward the pulling bodies the Sun and Moon). This direction is contrary to the normal direction a water ripple will take when simply flowing down stream. The Columbia River along Marine Drive is well suited for this analysis. This phenomenon has been correlated to Doppler-shifted then heterodyned (mixed) gravitational frequencies providing definitive proof gravity is an electromagnetic wave. The unique properties of the sands in this area enable heterodyning of gravitational waves on date and time relationships from the orbits of nearby heavenly bodies. When one is able to discern the difference between the occurrences of sand ripples formed from simple water flow motions, from the sand ripples formed by heterodyned gravitational waves, enlightenment takes place. Any emission from a heavenly body is Doppler-shifted from the continuously varying separation velocity due to its parabolic orbit. This of course includes gravity. There is mathematical proof using actual Doppler-shifted planetary velocities computing the gravitational wavelength at approximately .00713 Angstroms. There has been some confusion as to what is causing the sand patterns. It bears repeating that there are only two types; a fake, formed by simple water movements and a real occurrence formed by gravitational waves. IMAGE 2. Dry Sand Panoramic Photograph from type 2 conditions. Black lines are a concentration of paramagnetic rust particles. This natural detector provides visual proof of gravity waves. An increase of unidentified radio waves often accompanies this phenomenon. Proof gravity is an electromagnetic wave. Reveals a relationship between the gravitational field and the magnetic field. These patterns can occur only on specific dates and times. These are not drainage patterns; water always flows across the grooves never down them. The gradual slope of this beach is constantly unvarying. A video link below shows groove formation. The image shows the results of alignment after the sand has dried. These were formed by type 2 conditions. Drying causes the domains to tip over. The patterns arranged in the sand are immediate and visual due to the forming of liquid slurry of fine quartz and rust particles suspended in salt water. A slight agitated motion allows the particles to float in the slurry and self-align leaving the visual pattern. The phenomenon is concerned only with low profile shore water waves from 1 to 4 inches (2-10 cm.) deep. Only the last part, the exhausting of the water wave as it approaches the shore, is of importance. Unlike river sand ripples formed by constant velocity water flow in one direction only. The high concentration of rust particles found at this beach is required. Beach wave motion is different. The water flow is back and forth and the velocity goes from a maximum to zero then reverses direction. The back and forth washing like motion working alone on a gradual slope results in clear sand conditions. The un-restricted (no collisions) back and forth washing motions of a small shore line waves on a gradual slope will flatten out the sand. However, the collision of two water waves from opposing directions will form a line in the sands. IMAGE 3. This normal clear sand condition occurs outside the phenomenon dates as well as in-between its intermittent appearances. There are several ways to determine when the patterns are forming from gravitational waves. We can be certain the sand patterns are caused by heterodyned gravity waves when the rust particles are standing on end, also when the timing of the water waves is such that when the incoming waves are not colliding with the outgoing waves. The sand pools are part of this phenomenon, and when the surf normal blue hue becomes deeply discolored by black iron oxide particles. IMAGES 4&5. SYNODIC POOLS. This wide band of pools centered between high and low tide, formed at a re-occurring predictable timing for approximately three weeks. Photo date: 07/15/95 Swirling water lifts the sand and forms thousands of these pools of water. Occurring simultaneously for more than 35+ miles of coastline, accompanying this unusual swirling water are soliton like water waves which aid the pool formation. Unusual perpetual like or self-sustaining ripple motion of the surface water randomly occurs as well. The water waves concerned with here are shore water waves ranging from 2 – 4 inches high only and are not part of the crashing surf. The finals of the waves which reach the shore then proceed back out to sea. Discriminating the actual phenomenon from the appearance of lines in the sand due to simple wave collisions, as in type 1 patterns, can be confusing. Two opposing direction water waves often occur causing a collision and dropping the particles enabling a stationary water ripple at the point of collision and leaving a dark line in the sand. The type one patterns may be Doppler-related but are not considered part of the phenomenon as described. There may be no associated radio frequency match with this type. It is important to locate dates times when incoming waves are not colliding with outgoing waves. When the Sun and the Moon are in opposing positions in the sky opposing water wave collisions may occur. Conversely, when both the Sun and Moon are in relatively similar positions in the sky the water waves are not opposed. The particles which are free to orient and align completely unrestricted due to the slurry which suspends them temporarily, until they drop into position. This is similar to a compass needle floating in water, only free to rotate in three dimensions. Floating in this lightly agitated solution, the particles are in pseudo-weightless suspension. IMAGE 1 shows the alignment immediately after it occurs when the sand is still wet. Proof of a strong electromagnetic field is present; the black patch areas are paramagnetic particles trying to stand vertically on end, much like iron filings do when placed on a paper and a magnet is held below. Most events are centered to either side of Earth’s perigee and apogee dates. The best time to witness the most and the strongest events are one to three weeks to either side of Earth’s perigee and apogee dates, the beginning of the months of January and July. Because the events occur at synodic intervals, I have named the phenomenon Synodic Gravitational Sand Patterns, or Patterning. The proper date/time to witness is when the Sun and the Moon are in the same relative position in the sky when they are pulling from the same direction. At this time a single very small shore water wave will be occurring without collisions. The phenomenon has an orbital Doppler effect and a diurnal cycle. Type 1: Nothing unusual about type 1 patterns are simply the result of the collision of two water waves. The intersection of the two opposing flows forms a water ripple leaving sand patterns and grooves. Sluice box like effects separate the black rust particles out. The collision slows the water flow allowing the heavier iron oxide particles to fall out of suspension leaving a dark line. The wet sand remains hard and is easy to walk upon. This is not part of the gravitational phenomenon as described in this document. Type 2: Produced when a single unobstructed water wave flows back out to sea. Something invisible impeding the water flow produces a ripple and gouges a groove in sand. Type 3: Similar to type 2 but produced when water flows both directions. Increased field strength allows the formation to appear in the higher velocity incoming waves as well as the outgoing water waves. Forces forming them appear much stronger and grooves are more pronounced. This event is strong enough to cause rust particles to stand on end. Wet beach sand becomes very soft and more difficult to walk upon. Both type 2 and type 3 have been measured and correlate to unidentified radio frequencies (when one knows how to measure the groove-to-groove wavelength). During a receding wave, when the water is only one or so inches deep, these particles along with the standard sand goes into solution. Due to the unique turbulence that occurs in this receding wave the magnetic particles align themselves on electromagnetic field lines. Directing attention on lines that are uniform and between 16 and 30 inches (.41- .76 m) apart. These are the ones most easily identified as having come from something other than just flowing water. The electromagnetic field lines as described here cannot be from Earth’s magnetic field, as the event is intermittent. The black colored paramagnetic iron oxide particles are deposited at regular intervals. When the water slowly glides back out to sea, a mound and rift are left in the wet sand. When the conditions are at a maximum, from the bottom of the rift to the top of the mound measures approximately 3/16 inch, and 1 – 1.5 inches wide with a large hump between the grooves. One could stumble on them. The black rust particles form a line attracted to an unusual stationary invisible electromagnetic wave. It is similar to the type of mound and rift that is formed when water flows over a stationary shallow rod (1/8 diameter or so) resting on the sand. An unusual “double” water ripple gouges the grooves. First one ripple appears than about one inch later another water ripple with a deep groove between. The pattern placed upon the beach resembles an interference pattern at times and other times fairly uniform wavelengths. These grooves form intermittently lasting for several hours and longer, wash away then reappear over and over again until the event passes. Appearing then disappearing many times during the window. Sometimes the patterns appear in patches or cover the entire beach. When the phenomenon is at maximum, the wet sand becomes much softer (puffy) and more difficult to walk upon, much like the before and after changes of cooked rice. The gradual slope of this beach combined with the high concentration of iron oxide Fe2O3 particles forms a very sensitive detector based upon the domino effect. Very slight interruptions of the normal particle flow within the water produces this domino effect. Quartz is a semiconductor found in transistors and the rust on antenna guy wires is well known by ham radio operators to cause interference by heterodyning of signals. Similar to a coherer (an early device used to detect radio waves), the particles cohere then align on the electromagnetic field. Combined with the tremendous number of iron oxide particles allows for the visual effect. The phenomenon occurs as well on a calm day as a windy day. The slope of the beach may alter slightly through the seasons. A startling visual condition will occur when the water flow velocity increases beyond the attraction force on the iron particles. While watching type #3 patterns forming under the shallow water of a receding wave. Then, almost if by magic, they instantly disappear, under the fast flowing water leaving clear sands instead of the pattern. The formation releases and instantly disappears when the water flow velocity becomes too great. This only occurs during exceptionally strong events, when combined with an abnormal water flow velocity. A strong smell of chorine was in the air during an exceptionally strong event. Chlorine would result from electrolysis of the salty sea water. The beach near Hammond Oregon has a heavy concentration of paramagnetic particles. Traveling 60 miles south the particles had reduced a significant amount. The sand pattern grooves as well were much less pronounced. The Long Beach area in Washington also has a significant amount. Associated radio frequencies have been correlated and accompany the beach patterns. Having unusual sounds like, pulsing, snaps, crackling, pop or static, some of these signals are quite strong, and some frequencies correlate directly to groove-to-groove length measurements taken off the beach. The strongest signals have a clear pulsing (30-40 Hz.) sound when heard on a broad band scanner. The signal can be heard on both AM and FM. There is an art to scanning for these. Man-made frequencies must have been identified, as well as inherent peculiarities of the scanner itself. A barrage of weak (just above the background level) unidentified radio frequencies were recorded when the groove patterns break up into erratic multi fold patterns. They are most likely absorbed back into the beach elements when the patterns are regular. Thus, fewer frequencies appear. Assuming the radio waves travel back after the phenomenon leaves the beach area, is why the RF remains sometime after the groove formation stops. The frequencies shift but there does seem to be some patterning. The most common groove-to-groove distances were between 18 and 33 inches (.46 – .84 meters). On the date (1995) the scans were taken there were only a few television stations and radio AM and FM in this semi-remote area. The entire Pacific Ocean on one side was a radio dead zone and yet many unidentified signals were present, some quite strong. Birdies (signals inherent to the scanner) were excluded. The resulting radio frequencies from gravitational synodic waves that have heterodyned here seem to quantum jump to new frequencies, charging earthly elements upon one wavelength then discharging on another, much like phosphorescent rocks when exposed to black light. Without the proper equipment I was unable to determine with certainty if this quantum jumping was occurring. A theory unfolded after years of study, based on data from radio scanning and video logs. Gravity waves emitted from Sun and Moon, Doppler shift from parabolic orbital motions, then heterodyne in the beach sand slurry along with Earth’s gravity waves. An hypothesis is that the beach acts like a huge transistor or hot carrier diode. The combination of rust, quartz in the sand, and salt water as a conductor enable multiple Doppler-shifted electromagnetic waves to combine (heterodyne or mix) producing two more signals and a host of harmonics. In this case it makes them appear much larger. (Ham radio operators have long known rust on antenna guy wires is a common source of interference from heterodyning of signals). Quartz also possesses piezoelectric properties. The sand patterns appear when the field lines dwell, which produces the stationary pattern. In a dramatic video, soliton water waves appear when the electromagnetic field slowly sweeps across the area. The event can be associated with parabolic orbit Doppler relationships of Earth and Moon orbits, as well as diurnal cycles. Parabolic orbits are the source of Doppler shifts in gravitational frequencies. Near the dates of Earth’s aphelion and perihelion, Doppler shifted velocities near a dwell position. At this time Earth’s separation velocity with respect to the Sun passes through zero, then reverses. The aphelion and perihelion of the Moon is similar. The changing distance creates a Doppler shift in the Moon’s gravitational frequency. Earth’s orbit is similar but the apogee and perigee dates are different. IMAGE 3 shows another related spectacular event. On specific dates and times this less often seen event occurs. A tremendous up pulling rips the rust out of the sands forming large pits or sand pools in the sands. The water full of black iron oxide particles becomes deeply discolored. A narrow band of these sand pools form simultaneously for approximately 40 miles due to the huge amount of rust in this region. The sand pools event recurred at predictable intervals for approximately three weeks, and then disappeared. Swirling water lifts the sand and forms thousands of these pools of water. Soliton water waves accompany the unusual swirling water, as well as perpetual like or self-sustaining ripple motions. Soliton’s are waves that appear to be self-sustaining and last much longer than normal waves. The pools can be several feet deep and four to10 feet across. The phenomena occurred in shallow water from three inches to several feet deep. Date: 07-15-95 through 07-30-95 approximately two hours after both daily high tides. A striking change in the texture of the ocean surface precedes this phenomenon like a calming of the normal wave like motions. This is observed while looking out toward the horizon. The normal crashing white sounds of the surf diminish by a perceptible amount. The soliton waves produced during the sand pool event are small, one to eight inches high and 10 to 50 feet long. A regular wave would break and come up onto the beach, and then as it began to return back out to sea it would pick up an abnormal velocity for the slope of this beach. After the soliton moved outward toward the sea, it would pawl to the right bucking the 15-20 mph winds at the time as well as passing through incoming waves and traveling up slight inclines while gaining momentum. The soliton waves would literally fight their way along against obstacles normal waves could not. Clearly something was pulling them along. Jetting out pencil size squirts of water from their crest they had quite an unusual appearance. Traveling 100-200 feet, once outside the formation area they quickly dissipate. An important observation of the soliton’s is, when they move toward the ocean the breaking part of the wave crest is reversed. For example, a normal wave always breaks toward the shore. While the soliton waves which were big or fast enough to break were breaking toward the ocean while traveling out toward the sea. About 5% of the total waves for the hour the phenomenon occurred were soliton. I formed the hypothesis that what is pulling the soliton’s along is something similar to the magneto-hydro-dynamic drive of silent propulsion submarines. They are pulled along by very strong slowly moving electromagnetic fields produced by heterodyned gravitational waves. These are the same gravitational electromagnetic field lines laying down the sand patterns (grooves) except they are slowly moving. Because they are moving the sand can no longer record them, but water can latch on and get a free ride, much like surfing. As the gravitational body phases continue to change, the field begins to move to fast for the water to latch on to, and the soliton’s disappear. The grooves are formed when the field lines become stationary. Look for soliton water waves 5 to 30 minutes just before and after the Doppler dwell. An important item to recognize during the sand pool event is the dirty color of the incoming shore waves. Clearly seen on video, it appears something is gripping – latching onto the rust particles and violently pulling them up from the depths of the sand. The rust concentration gradually diminishes the further south one travels. So the sand pools may diminish in size with the concentration. However, there may be several types of this event. Some heterodyned gravity waves may pull on all the components of the sand and water. Here’s evidence that the water soliton waves are pulled along by a slow moving electromagnetic field: sand grooves which record stationary electromagnetic waves from a dwell of synodic movements, occur on either side of the pool formation times. See IMAGE 4. The appearance of the sand patterns correlates to a complex relationship of Earth’s orbit, rotation, tilt, and Lat. Long as well as the Moon’s orbit. The most frequent and strongest events are centered to either side of Earth’s apogee and perigee dates. Events of the phenomenon may occur at almost any time of the year by way of the Moon’s orbit combined with Earth’s orbit, and Earth’s rotation tangential velocity with respect to these bodies. These dates are much more difficult to predict however. The Doppler shift sources must be accounted for and topocentric velocities are required. Topocentrism is a system of celestial coordinates with its origin at a specific point on Earth’s surface. The geocentric velocities below are given for reference only. 1. Earth’s geocentric orbital separation velocity with respect to the Sun varies from +1790 kilometers per hour then reverses direction becoming a negative value. This velocity becomes zero at aphelion and perihelion. This is a separation velocity not orbital velocity. 2. Earth’s tangential velocity component with respect to both the Sun and the Moon. Earth’s tangential rotational velocity at the 46th parallel: 1165 km/hr. This rotational velocity with respect to the Sun cycles from zero at noon and midnight to its maximum at 6:00 A.M. and 6:00 P.M. solar time. This is a positive value between midnight and noon and negative between noon and midnight. 3. The Moon’s separation velocities with respect to the Sun are another complex variable that must be accounted for. Thus, each body has a continuously varying gravitational Doppler shift from their orbital motions. The gravitational Doppler shifted frequencies heterodyne (add and subtract) producing new, much larger wavelengths. The paramagnetic rust particles can leave patterns in the sands only when the topocentric Doppler shift dwells long enough for the particles to drop into a single position leaving the patterns on the beach. The particles are attracted to the momentary stationary electromagnetic field lines. The appearance dates involve determining when the topocentric Doppler velocity is dwelling. When the resulting field is momentarily stationary, patterns are recorded in the beach sands. When the fluxion field slowly sweeps across the area, soliton water waves occur. Establishing when the electromagnetic flux becomes momentarily stationary requires precise astronomical topocentric computer calculations. Studying the sand patterns in depth, I discovered that they are formed by helical (rotationally polarized) electromagnetic waves. Imagine a bunch of tree logs buried in the sand to various depths and angles. This illustrates many helixes and the patterns left on the beach. These waves have a special property. They rotate or spin. The waves cinch up, like the threads on nuts and bolts. They also have elastic like properties, they auger and slip. Similar to a propeller of a ship in water, they transmit a force. The pulsing on and off of gravity waves make them much weaker than the magnetic force. Indeed, they do transfer a force. The magnetic component of these electromagnetic waves may be appearing in the dark areas of the wet sand photograph (IMAGE 1). The magnetic and gravity fields are different wavelengths thus they do not react. Heterodyning of the Doppler-shifted wave produces on certain dates a wavelength that is the same as found in common magnets. This would be the reason why a multitude of radio frequencies of different wavelengths can be picked up that do not measure the same as the groove-to-groove measurements taken on the beach. Only one heavenly body source of Doppler-shifted gravity waves is required for heterodyning. Earth’s gravity field provides the second source. Considering multiple Doppler-shifted sources from the Sun, the Moon and Earth makes the predictions much more complex. Librations, sun spots, and anomaly’s on the moon surface make the predictions more difficult. The following calculations were done to establish a point of reference using the Sun/Earth only. By working backwards and using a method of trial and error, I actually arrived at the gravitational wavelength used in the calculations. I incorporated my Gravit26.bas computer program into the trial and error calculations. Trial and error gravity wavelengths are inserted in the program until it matches the results found at the beach at a given time/date. The separation velocities used in the equations are approximate values. More accurate values are required. On January 3, 1995 at 17:00 hours, solar time was used to calculate the below example (date of IMAGE 1). On this date/time, Earth/Sun Doppler value held (dwelt) constantly at 1083 km/hour for approximately one hour. On this date/time, the Moon location was: horizontal azimuth: 38 degrees; altitude: 23 degrees (as an astronomer measures, not as a navigator). This placed the Moon in a similar direction in the sky as the Sun, resulting in the single water waves required to satisfy ‘type 2’ and ‘type 3’ conditions. The bodies were not in perfect alignment but the pull from the two sources were in a similar direction thus reducing the possibility of water wave collisions. All factors add up, providing definitive mathematical proof. The main factors are an associated dwell of the topocentric separation velocities, and a relative sky position of both the Sun and the Moon. Topocentric separation velocity is calculated using your latitude/longitude position and requires a precise astronomy computer program. The object here was to determine if the Doppler-shifted wavelengths present at this date/time matched the patterns found on the beach as well as the frequencies found in the radio spectrum capable of determining if a gravitational wavelength could be calculated from the results. All the data correlated correctly with the findings resulting in a good conclusion. The ‘D’ represents the digits held within the computer memory but not shown. The Double Precision limit used in the calculations: max +308 min -324. If we assume the heterodyning of Earth’s surrounding frequency with the Sun’s Doppler-shifted frequency produced the 28-inch (.71 m) beach grooves as found in IMAGE 1, then the frequency = c / .71 = 422.5 MHz. This frequency is assumed to be the resultant of subtracting the frequencies of the two bodies (signal frequency was one of several present at this date/time). Assuming a gravity wavelength of .00713 Angstroms (arrived at by trial and error by incorporating the below), .00713 Angstroms converts to 4.204662777451454D+20 Hz. At 17:00 hours solar time January 3rd 1995, Earth/Sun topocentric velocity dwelled at 1083 km/hr. Earth/Moon topocentric Doppler velocity was moving from 736 km/hr. to 962 at this hour so will not be considered (the topocentric separation velocity dwell is the result of adding the rotation of Earth to Earth/Sun separation velocity. At this date/ time, the velocities added in such a way that the Doppler shift remained the constant value 1083 km/hr. for approximately one hour). f = ((c – 1083m/s) / (c + 1083m/s)) ^ .5 * 4.204662777451454D+20 Hz. f = 421,920,768 Hz or 421.9 MHz (comparable to the groove-to-groove distance and the radio frequency found at the time). The fact that there are two groove-to-groove wavelengths simultaneously appearing on the beach indicates there are either two gravity wavelengths or the beach elements are absorbing then re-emitting through quantum jumps, as proposed previously. At the 46th parallel Earth/Sun Doppler shift passes through zero approximately every 12 hours in combination with Earth’s rotation velocity. The Doppler frequency from the Sun passes through zero (reversing direction) twice daily when Earth is near apogee or perigee. At this time Earth’s topocentric tangential rotation velocity relative to the heavenly bodies becomes the dominate velocity factor. This information was taken from Doppler computer programs that I brought into my studies. The 12-hour cycle is evident in the visual phenomenon formed in the sands. Since gravity waves are capable of passing directly through Earth, the 12 hour cycle is created. Another approximately 6-hour cycle appears in the computer-generated Doppler data. It is easiest to see the signature left in the sand when the tide is receding. The beach grooves form on a 1 to 2-hour basis twice each day, assuming the Doppler shifts and body alignments are correctly date/time related. Several weeks observation before and after Earth’s apogee/perigee may be required to witness the event reach its maximum unless further refinements in the prediction can be made, making certain that the phenomenon is not confused with type 1 patterns. It is not necessary to be at the beach to detect Doppler shifted heterodyned gravitational frequencies, they are everywhere. They heterodyne with iron and internal components of radio frequency equipment resulting in a weak but track able signal when one knows how to search for them. Evidence is clear a whistler or packet of static can be tracked and correlated to the heterodyned Doppler shifted frequencies of nearby heavenly bodies. One can easily solve for the wavelength of gravity given the topocentric velocities of the Sun and Moon with respect to Earth (see the example given). Calculations incorporating the whistler frequency will result in a more accurate wavelength for gravity. The elevation above sea level is required for topocentric Doppler velocity. Doppler data near Earth’s apogee and perigee dates shows that a radio frequency whistler is associated and has been located by Burt Younglove WA7HI. The synodic whistler passes up through the radio spectrum at differing rates from below 4 MHz to 900 MHz and beyond. The whistler is a very weak signal just above the background level. This whistler is not related to lightning or atmospheric effects. The attributes are not fully known as yet. It may disappear briefly into the background noise then reappear further up the spectrum. You will have to keep your eyes open to keep track of it. The whistler is a very weak signal just above the normal static background level- tune in on a peak that is moving up or down in frequency within the background radiation. The rate and direction it moves through the spectrum is related to the date, time, and your longitude and latitude position. The intensity of the peak may vary, rising up out of the background radiation then dropping back into it. The whistler is related to Earth’s rotation and orbit around the Sun and travels upward through the spectrum from sunset to midnight. Burt Younglove WA7HI tracked Earth-Sun whistler for several hours in the early part of January, between 8 and 10 p.m. Burt was using an ICOM 756 Pro with an integrated spectrum display. Radio equipment incorporates super-heterodyning circuitry. High and low intermediate frequencies are used to build the tuning circuits. Manufactures may use different intermediate frequencies. Thus differing radio circuits will detect different frequencies from the phenomenon as it heterodynes within the circuit. However, the original source frequencies will still exist on each radio. Look for a whistler, or a packet of static that passes downward from high frequency to low frequency between the hours of 12 noon and midnight for several weeks before and after Earth apogee and perigee January 2nd and July 3rd, approximately. In general, tracking the Sun’s whistler and or static packet will have four cycles as follows: Increase in radio frequency from sunrise to noon. Decrease from noon to sunset. Increase from sunset to midnight. Decrease from midnight to sunrise. Topocentric velocities will be required to determine exactly which direction within the spectrum the whistler will be traveling. Expect extremely low diurnal frequency at sunrise. Another whistler originates from the Moon’s orbit. This whistler will pass through the spectrum at rates related to Earth-Moon Doppler-shift gravity frequency. Since the Moon orbit occurs every 27.32 days and is stronger it should be easier to detect. The Moon-bounce scheduler amateur radio software ‘MoonSked’ is required. UTC time must be converted. For example: Portland Oregon time (negative 7 hours from UTC during daylight saving time). The whistler or static packet as described here will be easiest to associate to the phenomenon allowing a more accurate wavelength calculation. Einstein’s gravitational theory of curved space-time has no force associated with it. Instead of a force, mass is considered to be in constant free fall. An illustration of electromagnetic wave to force conversion: the energy from the once-proposed huge solar energy production array satellite is beamed down to Earth. Here energy from the Sun is converted to an electromagnetic (microwave) wave beamed to Earth and converted to electricity and then to mechanical motion (force) via electric motors. Then, the question we should ask; “if man, using the elements of nature, can convert an electromagnetic wave to mechanical motion (the force) why could not nature?” The answer is that it most certainly can. An electromagnetic wave can be converted to a torsional form enabling the direct transmission of a force without physical mechanics. The neutron Compton wavelength = 1.319590898 x 10-15 m. This is the wavelength of the neutron at rest; the wavelength is dependent on its velocity. The proton has a similar wavelength. The Doppler heterodyning calculations concluded that the gravitational wavelength is approximately .00713 Angstroms (7.13 x 10-13 meters). The neutron and proton are the basis for atomic weight and stoichiometry. It becomes clear that they are related to the wavelength of gravity. Why this wave cannot be detected directly is due to its passage through everything (including the instruments used to detect it), altering the outcome of the experiment. It is hidden if one attempts to detect it directly. I believe the gravity wave is emitted from the proton and/or neutron and becomes the ether field. The rotating helix wave passes through everything enabling the properties of inertia, length contraction, time dilation, and the bending of light. The rotating helix wave concept is easily understood but requires enhancing the rules of superposition, which then allows complete comprehension of the double slit and wave particle duality, as well as the EPR experiment. I concluded that some type of hidden interaction (a unique collision or transferring of force in the case of the rotating helix) between electromagnetic waves of similar wavelength exists. Briefly, by extending the rules of superposition we include an energy interaction along with the confirmed appearance to pass directly through one another unaffected. The Ring Laser Gyroscope suffers from an effect known as “lock-in”. This is evidence that there is a minute alignment force between in-phase electromagnetic waves. If configured correctly, it is capable of supporting attraction and repulsion. When the ring laser is rotating very slowly, the frequencies of the counter-rotating lasers become very close to each other. At this low rotation, the nulls in the standing wave tend to “get stuck” on the mirrors, locking the frequency of each beam to the same value, and the interference fringes no longer move relative to the detector, which causes the device to no longer track angular position. With respect, I choose to leave some controversial topics for dissection at a later date. Once the synodic gravity wave phenomenon is comprehended, some difficult physics mysteries become easily understood. 1. How the ether field composed of gravitational waves can be undetectable by Michelson-Morley experiment. 5. Time dilation and length contraction can easily be understood. 6. Results found in EPR experiments. Background radiation thought to originate from the Big Bang appears to come from everywhere. I hypothesize that some of the background radiation in the cosmos is the result of Doppler-shifted, then heterodyned gravitational waves. By heterodyning, Doppler- shifted gravity waves result in much longer wavelengths appearing to come from all directions. I have built a working prototype gravity wave generator. The output is an axial rotating, rotationally-polarized microwave beam. The device is capable of forming small surface ripples about 50 feet out on a normally calm lake. The device is not coherent enough to make propagating water waves, only ripples. I present these arguments against curved space-time of the general relativity theory. Not only does the theory have no force component, it does not comport to quantum mechanics. The mathematics does prove to be correct. Nevertheless, the concept is erroneous. The explanation of gravity by general relativity has no reality to it. It has a flaw! There is no gravity force in it. Instead of mass being posited as a force it is considered to be in constant free fall. There is no attraction force in the space-time concept in the general relativity gravity theory. How can simple questions like, what holds you down to Earth, and why do spring weight scales work? Hydroelectric power by way of gravity provides a lot of electricity without a gravity force! There must be an interchange of something for these effects to occur. As a matter of semantics, since gravity is a force and since curved space-time gravity has no force, you cannot say that gravity is not a force, but is nevertheless the result of curved space-time. The word force has one meaning. If it does not push or pull you have misused the word. We might use words in a logic equation: gravity = force = (curved space-time gravity theory). The equation does not hold true since there is no force in curved space-time gravity. So, curved space-time theory simply cannot hold true! It is found that Newton’s equations do not hold true at great velocities. Still, math terms can be added into Newton’s gravity equation to include electromagnetic wave-to-wave interactions! It is found that the source of gravitational bending of light and of gravitational lensing is the minute interactions between gravity and light waves, not curved space which has no force! Also, the principle of a rotating helix EM wave that passes through everything accounts for mass increase, length contraction, and time dilation from near-light-speed! These topics are briefly covered in a companion e-book ‘Synodic Theory of Gravity and Electro-Magnetism’ found at synodicgravity.com. It arrives at the same conclusions as curved space-time theory, but from a completely different perspective. Gravity is an extremely small wave and passes through everything thus cannot be detected by normal means. These waves compose the Elohim field. Planet formation theory. You can’t have things falling inward following geodesics without violating Newton’s 3rd law and still end up with a circle. Earth would end up a slurry or like jelly, not possessing the extreme pressure found within its core. Only a true force can provide this. Without a force why would a planet end up round? And, what pray tell would keep it solid in form? There is no adhesion force… it would simply fold in on itself! Nothing keeps the center in the center. The wind, rain, rivers, and earthquakes would have torn it to a shambles eons ago. Fossil records would have disappeared long ago. Trees use both a Sun follower and a gravity sensing mechanism. A trees natural tendency to grow vertical would not respond without some type of force transferring sensing system in effect! Causality and Conservation of Energy no transfer of energy thus no effects. Without the “Geotropism” gravity sense mechanism in effect, trees growing on the other side of the Tropic of Cancer or Capricorn would simply lean toward the Sun (equator). The Moon always presents its heavy side toward Earth. (Orbital preference) The Moon orbits Earth with its oblong and or heavy side always facing us! The Moon maintains an exact rotation rate with its orbit of 27.32 days. Only one problem! I present this question to those who believe in curved space-time gravity. How is free fall going to pull one side of the Moon more than the other resulting in this alignment, when there is no force involved in curved space-time gravity? There are counter arguments against this however. The point is of important however. The opposing orbital forces centrifugal and gravity seem to prefer an alignment. Another example: The space shuttle prefers to orbit either nose up or nose down. It appears the equations for gravity and centrifugal force would conclude an oblong object prefers or seeks to align its axis outward. Since there is no force in curved space-time, an oblong mass would not prefer to align in any particular direction! It has no preference in orbital position. This leaves two possibilities. Either the precision-timing of the Moon’s orbits with its rotation is coincidence, leaving the oblong direction facing out (which I hardly accept!) or else curved space-time gravity has a flaw (uh-oh…)! Curved space-time theory has no explanation. There is no adequate explanation of how mass generates curved space. What causes space to warp? You can just postulate “that’s what mass does” or try to find a different analogy. Something like matter being a collection of knots or kinks in space. The theory just postulates that mass bends space. It really doesn’t fully explain how this happens. I notice that people often use two theories when explaining gravity. Often, “a force” is referred to when speaking of ocean tides and orbits! Theorists conveniently use the words “gravitational pull” Bouncing from one theory to the other. Either you have a force or you don’t! I contend that once you have defined the geometry of one theory you can’t simply project it back to another theory’s geometry, and then begin to answer questions regarding forces. This is applying two separate theories to explain one phenomenon. You have set theory constraints (boundaries so to speak) which cannot be altered! You cannot project from curved space-time back to the Newtonian space model geometry. When you declare the space as curved then curvature is your working postulate and that’s that! Sure, the math can do it, but the model? There is more than one way to arrive at the correct mathematical answers. I will present here another model that will answer all these questions and more. Curved space-time is a concept in general relativity to explain free fall in terms of geodesic paths. General relativity explains trajectories without the need of any interchange of anything, just the curvature of space. The current theory of curved space-time does not support a connecting force between the Moon and Earth. It also does not contain quantum mechanics. Current space-time theory explains gravitational attraction as matter obeying its universal law: “Matter, when left to its own devices, will travel along a geodesic”. For us on the surface of Earth, all geodesics lead towards the center of Earth. General relativity explains trajectories without the need of any interchange of anything. Unless the curved space warp is elliptical, you cannot get an elliptical orbit without an elastic force connecting the two bodies. The best you can do is either a straight line or a curve directly related to the space-time warp. A true force allows for an infinite variety of elliptical orbits. In my opinion orbit simulation programs using the warped space-time equations will not work, since there is no force to reduce/increase the bodies’ orbital tangential velocity, just a way to point it in a new geodesic direction. Earth’s velocity varies as it whips around the apogee/perigee points. This velocity variance is from a “real” gravity force. The velocity of the body must vary in order to achieve an elliptical state. Would not space-time have to be warped in an elliptical shape? Even so, how would the ellipse rotate as is required? The misused phrase “free fall” implies a real acceleration force which the space-time warp theory lacks! Curved space-time theory simply cannot not hold true! Are we sure we have exhausted all the other alternatives? Remember, it is true that Newton’s equations no longer hold true at great velocities. Is the only alternative left to us the curved space-time of general relativity? The answer is…no! The electric charge is the physical property of matter that causes it to experience ‘a force’ when placed in an electromagnetic field. Similarly, two particles such as electrons with the same charge repel another much like the same poles of a bar magnet. This may seem to be a rather simple question: what gives an electron a charge? What quantum force gives an electron a charge? Why doesn’t a neutrino have a charge or a Tao, or muon? No one knows yet. At this point, the charge of a particular type of fundamental particle has to be postulated and accepted as a given, as one of its fundamental properties. It is not clear whether or not some ultimate answer is possible, or necessary. In connection with “what is charge”, people just beginning in the field learn “that’s just how it is”; while experienced professionals realize that it has to do with an underlying, unexplained symmetry that “just is”. The Synodic theory associates gravity and the electric charge. Superposition is a fundamental principle much of physics is designed around. If it could be shown that a light wave collides as well as passes through another light wave then the foundation of physics would be disturbed. This would apply to gravity: if electromagnetic waves collide with others then the force could be put back into gravity. The gravity field properly configured (rotating helix) could carry a force. View the video: “Superposition and Interference (Early Major Physics Error)”. Should you plan on a serious study of the gravity phenomenon at the beach at Fort Stevens, a 4-wheel drive vehicle is a great idea. You should budget about $500/week for your adventure. Make it the vacation of your life. Coastal Oregon is among the most scenic areas of North America, with many famous and not-so-well-known world wonders! On your journey down the coast–if you decide to expand your adventure–you can observe this gravity phenomenon on more southerly beaches. I have seen it occurring over at least 100 miles or more, although the Fort has the most excellent conditions for it. Three weeks is recommended for the serious investigator. Have fun chasing synodic gravity waves! I was vice president of the family paper box manufacturing business for 25 years. I conducted 15 years of gravitational research and have an associate degree in mechanical engineering. I have an avid interest in physics and am entirely self-taught. My findings were a front page article in The Daily Astorian on June 21, 1994 titled Lines In The Sand. I was interviewed by Fox News and, on July 15, 1995, by Eric Schmidt of KGW-TV for a segment called Gravity Phenomenon. I have published several articles in Infinite Energy magazine, including ‘Detection of Gravity Waves’ and ‘Examining Complex Spectra for Fundamental Wavelengths’. I am the author of the ‘Rainbow’ computer program, an analytical software of the atomic spectrum. My most recent paper ‘Early Major Physics Error’ on interference and superposition can be found on my website www.synodicgravity.com. I have posted several videos on these subjects to YouTube. 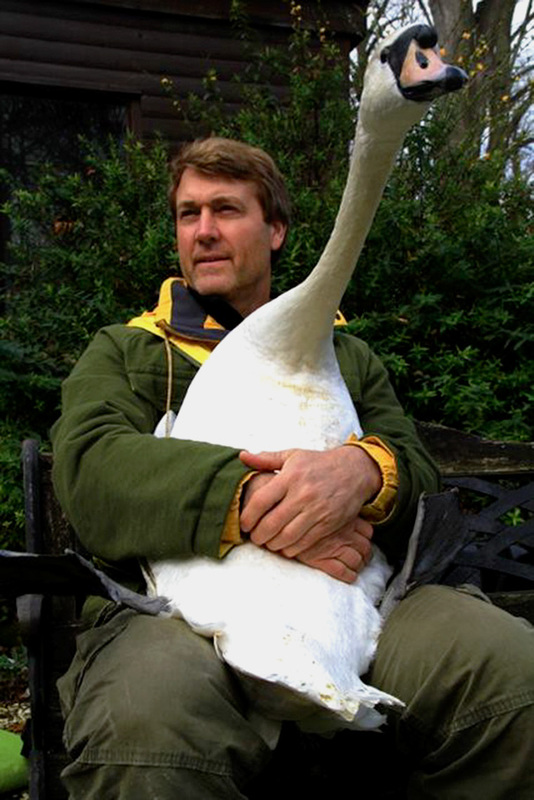 Swans are not particularly affectionate or approachable animals. They’re territorial and can be quite intimidating. 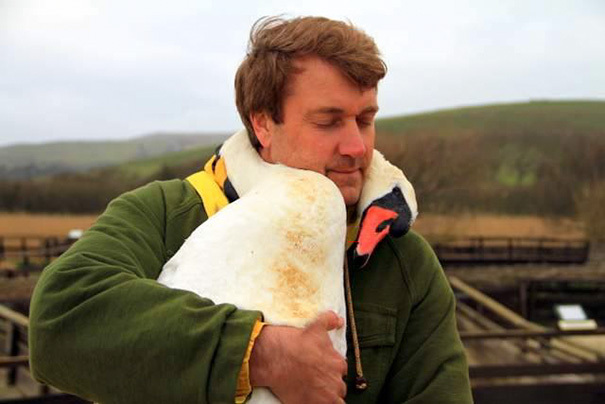 Which is why the moment when an injured swan hugged Richard Wiese, the host of the television show “Born to Explore” is so touching. 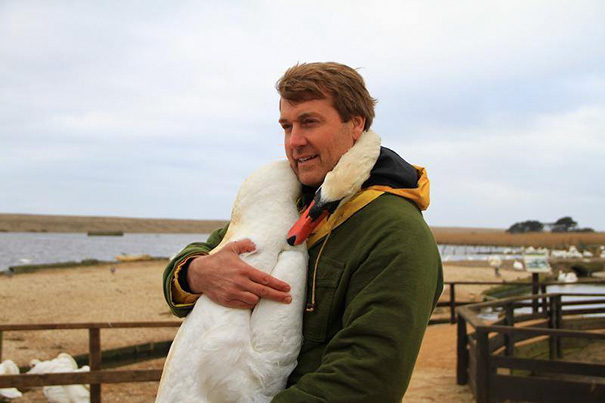 A few years back, Wiese was visiting the U.K.’s Abbotsbury Swannery when he ran into the swan who had been injured after flying into a chain-link fence. 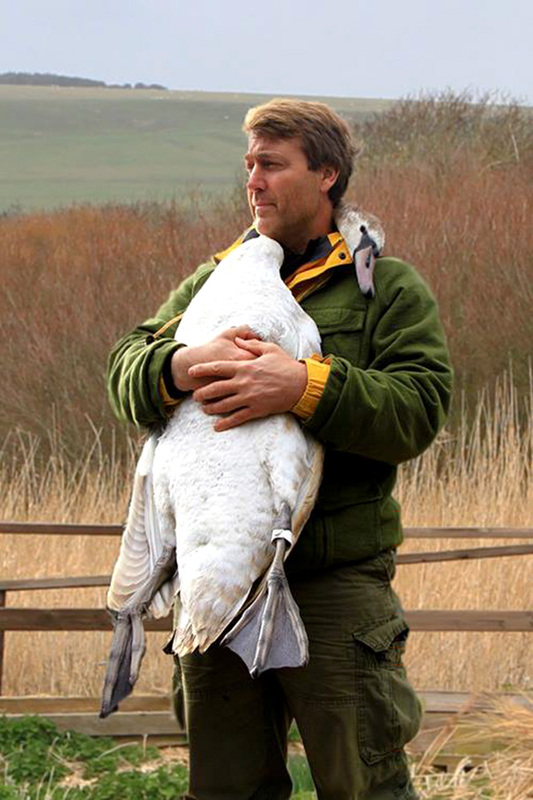 Wiese helped to examine the swan by holding her.